‘Tis the season for buzzer-beaters. Yesterday, there was that insane three-quarter-court dagger from UConn’s Jalen Adams to force a fourth overtime, Buddy Hield’s half-courter coming just a hair too late, and Utah sending it to overtime against Cal after Lorenzo Bonam ran through their entire defense in three seconds. The actual shot at the end of this buzzer-beater isn’t all that impressive. A solid finish through a trio of tall defenders, yes, but America is a vast land and there is a high bar that buzzer-beaters must clear to become truly noteworthy. However, the story here makes it. 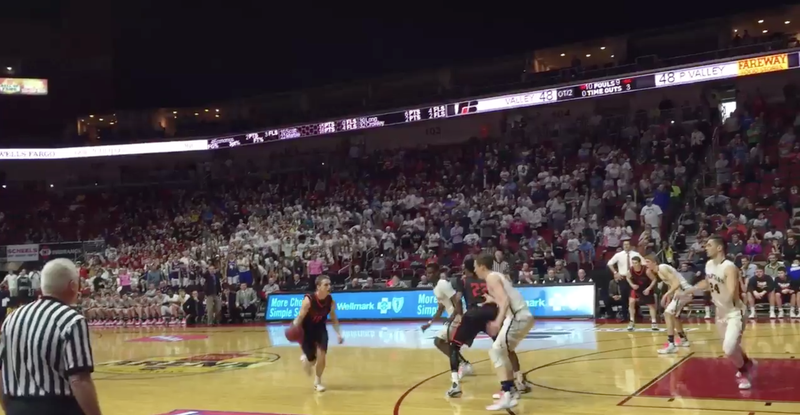 That’s Valley senior guard Turner Scott winning the Iowa 4A state semifinal on the only shot of the second overtime. The two valley-themed schools played a defensive struggle of a game, and the winning Valley decided to take that to its logical extreme and prevent their opponents from touching the ball at all in the last four minutes of the game. Valley played keep-away for the duration of the overtime, and Pleasant Valley’s attempts to harry Scott into giving it up were unsuccessful. Pleasant Valley senior Will Carius scored 34 of his team’s 48 points, but Valley was able to force all manner of tough shots with a 1-3-1 zone. Elsewhere, Iowa City West will get to play Valley in the title game after this crazy tip-in buzzer-beater. High school basketball is so weird.